Do you want to take Your Cooking Skills and More Importantly Enjoyment to the Next Level? If so, keep reading as we Designed this Piece of Culinary Perfection for YOU! >>> Aesthetically Beautiful - Exquisite Japanese Style Aerodynamic Shape with Classical 3-Rivet Handle Designed to Impress - Zelite's Breakthrough STORM-X Finish! >>> Premium Packaging - Outstanding Packaging making it Perfect for Gifting whether it be a Wedding, Birthday, Christmas or just a Nice Treat for You or a Loved one! 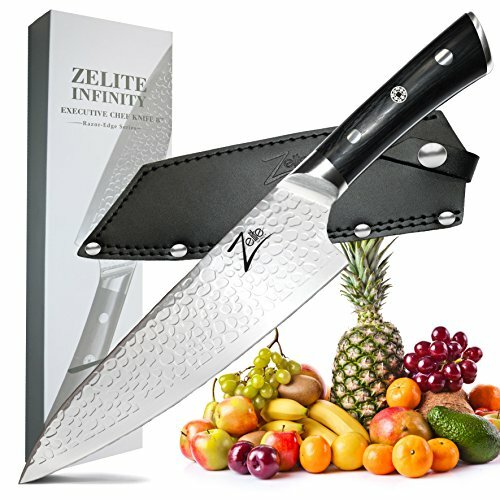 ---> Simply Click "Add to Cart" to claim the Best Performance Executive Chef Knife on Amazon...and reap the benefits of becoming a Home Master Chef...100% risk free! From the Manufacturer: If you see the green "In Stock" above, place your order before they're sold out! ✅ CLASSIC TRIPLE RIVETED BLACK PAKKAWOOD HANDLE >>> Offering Graceful Beauty and Impeccable Performance this Sleek Design includes a Forged Full tang Handle for Strength, Durability & Control with the Unique Zelite 15-piece Luxury Silver Mosaic for Total Refinement! Rare Tapered Bolster for Extreme Comfort Which Encourages the Pinch Grip Style of Cutting, Perfect Balance for Minimal Wrist Fatigue! RE-Series Knives for Chopping and Slicing - You're going to Love This! ✅ 100% SATISFACTION or MONEY BACK GUARANTEE - TRY IT RISK FREE >>> Lifetime Warranty against Manufacturing Defects (only if purchased direct from 'Zelite Infinity' - check item is "sold by Zelite Infinity"). Our Chef Knifes have been built with Perfection in Mind. Ideal Multipurpose Cutlery Gift (Christmas, Weddings, Birthdays, Fathers Day, Mothers Day), for Home Cooks, Professional Chef's, Culinary Students and more. You can't lose. Limited Supply, Order Now before they are Sold Out! ✅ PREMIUM JAPANESE AUS 8 STEEL DEEP BLADE >>> Engineered Sharpness this 8-inch 50mm Deep Knife has a traditional Japan blade and handle shape -likened to the Gyutou. Added vanadium improves wear resistance and refines the grain for both good toughness and the ability to sharpen to a very keen edge that lasts longer. Rockwell Hardness HRC59 after Liquid Nitrogen Cooling. Large Knuckle Clearance, Aerodynamic Japanese Style Sleek Design! Butcher like a Top Asian Pro - Mirrored STORM-X Finish! If you have any questions about this product by Zelite Infinity, contact us by completing and submitting the form below. If you are looking for a specif part number, please include it with your message.